Safety grills are not only used for Windows and balconies, but also safety doors or homes. This helps home owners see guests and intruders visiting their homes. Traditionally grills were only used in safety doors. Today you may also find thin plates of SS (stainless steel) that are cut intricately, used instead of grills.Plates cannot be obviously welded as grill to form designs. These SS plates used for safety door are laser cut through machines into desired design. 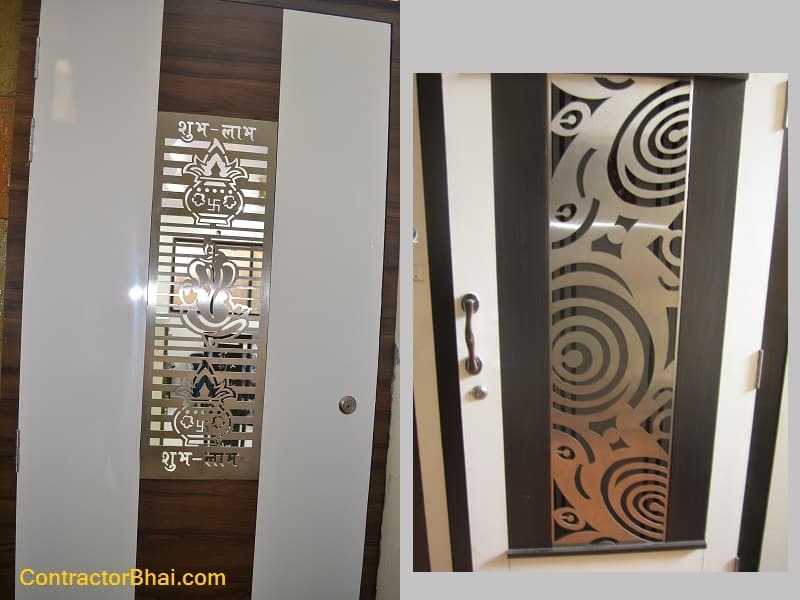 As like SS grills, SS plates for safety doors are readily available in market in standard sizes with various designs. Incase of bulk order, SS plate can be cut into required design and size. The SS plates used for safety doors are either 3mm or 4mm thick. You have thicker SS plates too, but are used as per door size and thickness. SS laser cut plates are used in various fields and different purpose too. Like huge SS laser cut plates used for decoration purpose, to create sections, inner walls, bed headboard, tables, façade and more. But the SS plates used for such purposes are definitely much thicker and stronger than the ones used for safety door. SS grills are cheaper than SS plates used for safety doors. The SS laser cut plates are costlier product as the plates need to be cut through laser machines which neither are cheaper. Also the program used for laser cutting is expensive one. Whereas SS grills can easily be welded into desired design. SS grill costs around Rs. 1,500 to Rs. 1,600 per square feet whereas a laser cut SS plate cost starts from Rs. 3,500 per square ft. The cost of SS grill increases with design sophistication and size too, whereas SS laser cut plates cost increases with only size. As like laser cut SS plates, MS plates too can be made. MS laser cut plates are not as costly as SS laser cut plates. But MS i.e. mild steel will turn dull and rust sooner than SS i.e. stainless steel plates. Also maintaining SS plates is much easier than MS plates. Therefore why save on few penny and compromise on look and feel of your home entrance. from where can i get this done ?